Didn't Deidre do an amazing job? It is seriously just what I want. So simple. So clean. So freaking legit! Say goodbye to this bad boy. We are officially parting ways forever. Here's what happened. 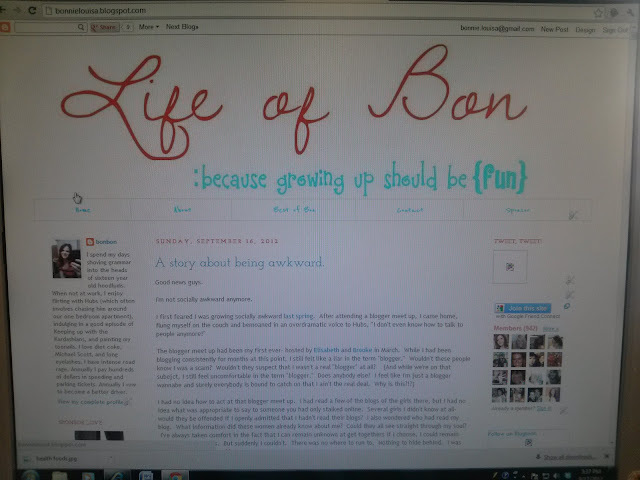 I desperately needed a new blog design. Desperate as in "I've had this same design for ten months and although I loved it at first I am now so sick of it that I could literally projectile vomit all over my computer screen every time I open my laptop" kind of desperate. Yah. It was bad. So, I posted a frantic and desperate facebook message, "HELP PLEASE! I need a blog designed cheap and fast!" The fast part was important. The cheap part even more important. I got back a couple of offers of blog designers who were cheap. I looked at a couple of sample blogs and was narrowing in on a decision. Then Deidre told me she'd do it for free because she's just that gosh darn nice. And so, Deidre did her amazing free work and by golly, you'd never know the blog design was free from the looking at it. Deidre, my dear, you have out done yourself and I simply cannot thank you enough! Does this lady deserve a round of applause or what? Let's give her a round! In other news, a student from last year saw me in the hallway for the first time this school year. He yelled out to me as I scurried down the hall to retrieve my copies, "Teacher! You went blonde?!? Huge mistake! You were way hotter brunnette, just to let you know!" Uh... thank you? Kids these days! Just where do they get their nerve? P.S. Do you notice those super professional looking social media buttons on the top right side bar? Do those things look amazing or what? Now you can follow me any way you want because it's that freaking easy! Very nice! I just got mine redone this week too. Best felling to have a fresh look. Enjoy! i LOVE it! it is super cute!! It looks great! So cute! Love it! So fresh and so clean clean. Looks so good! I got mine last night too!!!! LOVE IT! it looks great! i just got a new design and it's definitely a breath of fresh air! Love it - it looks awesome! Also, I love to hear your stories about your high school students. I taught high school math the last 2 years & some of the things those kids come up with should be compiled in a book somewhere! Looove it! She did a great job! LOVE THE DESIGN!!! Deirdre did an amazing job! I love blogs with lots of white space because it's so easy to read and navigate. I love the way you have it laid out! Ooohh, love the clean header! (but I bet you get that a lot. haha) I cleaned my blog up recently and it is a great feeling, isn't it? I am loving the new design. Simple elegance. I can't believe that student said that to you... oh children these days. Looks so fresh and cute :) Enjoy! Great update, I love it! That toilet paper story has me cracking up lol! LLLOOOOOVVVEEE it! Simple and elegant! What a great color combo! Love the new design...so very cute. Seriously next time you see that kid in the hall I think you should trip him! :) You could so totally pull it off as an accident! It looks fantastic. Deidre did a great job. You did look better with long brown hair but I understand the need for the change and you still look great with short blonde! Thanks for stopping by and the lovely comment! Following you back - I do like your design - I'm a fan of the clean look myself.